Vehicle Trackers Leeds & Vehicle Tracking Leeds are a speciality at Safe & Sound. From our head office here in Leeds we carry out many installations of vehicle trackers. A lot of our customers enjoy the mobile fitting service of their new vehicle tracking device. With this mobile fitting service we can supply & fit your chosen vehicle tracker or vehicle tracking device at a location throughout Leeds. This may be your home or work address. We regularly undertake the installation of these vehicle tracking / trackers to all makes and models of vehicles. 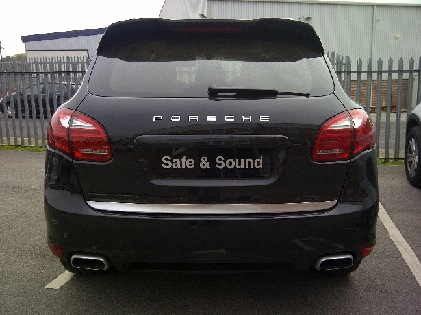 Todays vehicle tracker / tracking installaion was on a 2013 Porsche Cayenne bought from the Porsche centre in Leeds. We carried out the installation at the customers place of work not far away in the Shadwell area of Leeds. Safe & Sound are Thatcham Recognised Installers of vehicle tracking and vehicle trackers giving you complete piece of mind when you choose one of our products. Vehicle tracking offers many benefits and is now the first choice for customers looking to protect their new, valuable invetments. We offer a wide & varied range of vehicle trackers to cover all vehicles, whatever your requiremants. Please feel free to contact us and we will be more than happy to advise you in the right direction. Almost Real-time tracking via online portal. Packed full of features including individual journey reporting, vehicle time sheets, geofence alerts and vehicle service alerts. Suitable for Cars, Vans & HGV's. ✓ Almost Real-time tracking via online portal. ✓ Packed full of features including individual journey reporting, vehicle time sheets, geofence alerts and vehicle service alerts. ✓ Incredible value for money. ✓ Suitable for Cars, Vans & HGV's.